GATE Chemical Engineering Syllabus (CH): GATE Syllabus is based on the different stream according to the qualifying examination. IIT Madras has define GATE syllabus in this year according to the 23 papers. These will be conducted for admissions to the M.Tech programmes which is offered by the IITs and IISC. The GATE syllabus 2019 will be same according to the previous year. The national level engineering entrance exam will be conducted for post graduation courses on February 2rd & 3th and February 9th & 10th, 2019. 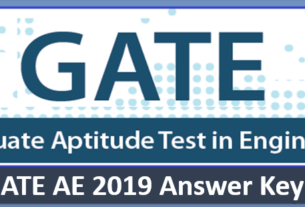 Candidates need to review GATE syllabus 2019 for the stream that they will be appearing for.The syllabus defines that what are the topics their subtopics they need to prepares for the appearing examination.Candidates can download GATE syllabus 2019 from below given table where the syllabus are given for every stream. The syllabus is the very important part of the examination because it plays an important role in the examination. GATE Chemical Engineering Syllabus (CH) consists of nine sections such as Engineering Mathematics, Process Calculations and Thermodynamics , Fluid Mechanics and Mechanical Operations, Heat Transfer, Mass Transfer, Chemical Reaction Engineering, Instrumentation and Process Control, Plant Design and Economics and Chemical Technology.